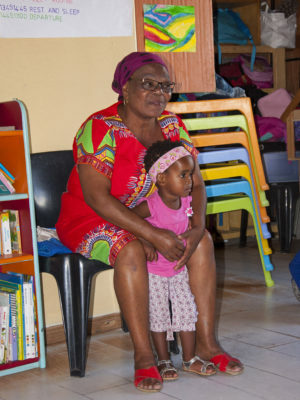 Whereas in the beginning not more than only a few young kids had to be taken care of during the day, meanwhile the Imizamo Yethu Educare Centre became one of the biggest supporting systems in the close vicinity. At the present time between 70 and 90 kids up the age of six are looked after in order to put their mothers in the position to work on a regular daily basis. The youngest up to the age of two stay in the kindergarten. Proper hygienic conditions, healthy food as well as basic treatment are provided. They are entertained by playing games with a main focus on the development of elementary skills and on the coordination and control of their senses and bodies. The group of children between three and six are educated in a pre-school. As the little ones, they also get healthy food – breakfast as well as lunch. Furthermore they receive basic care and are taught in hygienic behaviors. On top of it they get prepared for their first year in school. Although playing is obviously an important object, priority lies on getting them to learn about elementary educational principles. To reach that target storytelling, painting and drawing are main topics in lessons. Pupils also have to get used to keep a scheduled timetable. Lessons are held in Xhosa and in English. Last-named is essential as in South Africa the knowledge of the English language is still condition for getting trained and – later on – working in a qualified job. To aim that goal, simple methods such as blackboards, posters, and pictures are being used. In some rare cases, pupils bring their own schoolbooks or drawing primers. On closer inspection above mentioned facts can unfortunately not guarantee the required quality to get the children prepared for public schools. Another great step is achieved! The contract is signed and the purchase for the new piece of land is complete. We will work out now the entire planning of the property and elaborate a master plan. And then we need sponsors for the next construction stages of the houses! We received the confirmation to buy the land for the new school. The contractual agreement has to be settled. As soon as the purchase of the land has been completed we will work out with our architects the entire spatial planning of the property. After that the master plan will be prepared to determine the necessary financial support. The purchase of the property will be financed mostly by our own resources (thanks also to our supporters). For the various construction stages of the houses we are looking for Sponsors! One big goal is achieved – we got the official registration for the school in october 2012! Today a big part of Nomankhayas private house is used for school rooms. This is suboptimal. During the past few years, Nomankhaya did a big effort to provide sufficient space for the school. But even reconstructing the house a number of times, annex rooms to the existing building etc. was not enough. There is still additional necessity for room. And there is no outside area that could be used as a playground. There are still a big number of children without the possibility to go to school. In the area there are some unused zones. We did approach the owner company of this property and have started negotiations to acquire that land. The plot is only approximately 200 meters away from today’s premises and it has a perfect size of approx. 4500 m2. This would be good enough to build a school with sufficient room including a playground and an additional community centre. We have started the planning and we hope to be able to present a first draft soon to you. With a big sponsorship of Wella we could remodel the house again. All the kids are now on the ground floor, which simplifies the daily routine enormously. Nomankhaya ist now living on the first floor. Also all the demands of the authority concerning the safety regulations are now fulfilled. The planned improvements to the outside area have been cancelled. We have decided to focus on the registration of the school. This year we try to focus on the preparation to get the school officially registered. Then it would be state-approved. At this point we would have reached a really big milestone and first step into economic independency. We gave guarantees to all employees (cook, supervisors, and teacher) and to Nomankhaya on an adequate salary. The aim is to provide as much healthy food as possible to the children. Abstain from convenience food – move to healthy food such as fresh vegetable and fruit. Offer meet or fish from time to time. Buy from the local merchant instead from the big supermarket chains. Most of the required inspections (such as from the health department, fire department etc.) already have been passed successfully. At the time when the school can finally get registered these inspections have to be redone but are then only a matter of form. The number of children already has been reduced dramatically to meet the requirements regarding the available space per child ratio. As a matter of fact we unfortunately had to reduce the number of children because of this regulation. One of the reasons this instruction has been done is to meet required quality standards on teaching which makes perfect sense even causing the fact that we had to reduce the number of pupils. To easy the problem a little bit and to extend room capacity one additional room has been built on the 1st floor. The garden as well as the playground are dusty and exposed to the hot sun. As to that, making proper use of it is almost impossible. By growing and planting green fields as well as installing flexible sun protection these circumstances can be redressed. As the rubbish bins are located right in the middle of the garden, they block space and must therefore be embedded in a wall aside. This project has been cancelled. We have decided to focus on the registration of the school. At the moment, the roof is leaking and has to be tiled. During the periods of rainy winter days water flooding the class-rooms is no exception. in the group of the three to six-year-old to improve the teaching quality. Due to the large number of children at the present stage, efficient teaching is impossible. None of the kids can be incorporated in a proper way which also prevents necessary promotion. The lack of income emerging will be substituted.